Leading Manufacturer of vacuum pump for process industries and vacuum pump for process industries application from Ahmedabad. Two Stage Vacuum Pump for Process Industries are better designed than single stage vacuum pump, having advantage of higher capacity at High Vacuum and also requires low quantity of water at low Pressure compared to single stage vacuum pump. 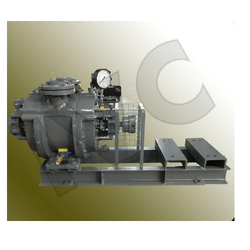 The pump can be provided with closed loop liquid operation, automatic control and with other required features. There are no Teflon balls inside the pump to deteriorate vacuum performance compared to single stage vacuum pump. Single Stage Vacuum Pump for Process Industries Application are equivalent to most reliable SLM-MANEKLAL design. These rugged pumps are simple for smooth operations and easy to maintenance. Looking for Vacuum Pump for Process Industries ?